Beautifully designed, the Verbatim Sync & Charge microUSB Cable with Lightning Adapter transfers files to and from your microUSB or Lightning device, and any PC with a USB port while simultaneously charging your device, eliminating charging downtime. 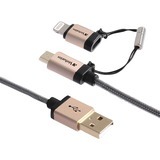 The microUSB cable comes with an attached Lightning adapter, making this cable also compatible with your Apple devices. MFi certified, the cable is designed for use with Apple products, ensuring the highest quality and reliability. The Verbatim Sync & Charge Cable can deliver 2.1 Amps, making it ideal for charging tablets, and great for charging smartphones. This cable is also great for charging other microUSB devices, such as e-Readers and Bluetooth headsets. Made from high-grade materials, the cable itself is durable and tangle-free.